In a BBC Watch post which went viral – the effects of which are still reverberating today – Hadar Sela reported on a Tweet by BBC Gaza correspondent Jon Donnison with a photo he erroneously claimed was that of a dead child in Gaza. 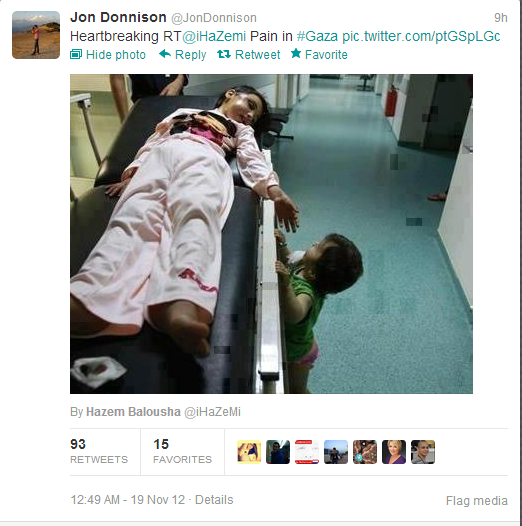 The incorrect information sent to 7,971 of Donnison’s followers was originally Tweeted by Hazem Balousha – a Palestinian ‘journalist and social activist’ – and included the photo with the words “Pain in Gaza”, to which Donnison added his own commentary – “Heartbreaking”. However, blogger Adam Holland replied to Donnison, informing the BBC journalist that the photo was not from Gaza – but, rather, from Syria. Donnison later acknowledged his mistake and deleted the Tweet. However, in addition to the sloppy journalism by Donnison, the man who originally Tweeted the photo of the child, whose judgment Donnison trusted, has an interesting background himself. Quite interestingly, Balousha is also a Guardian journalist who has co-written pieces with Harriet Sherwood, Peter Beaumont and Chris McGreal – and was described as a “colleague” by the Guardian’s Richard Adams in a live blog on the Palestine Papers in 2011. McGreal’s Jan 7, 2009 report written with Balousha – which McGreal cited in a recent report, on Nov. 23, 2012 – suggested, without any proof, that Israeli soldiers beat Palestinians in front of the their children to humiliate them, and even resurrected the Al-Durra libel in service of a broader narrative suggesting that IDF cruelty towards Palestinians “draws many into the cult of [suicide bombing] the ‘martyr'”. The overwhelming majority of Balousha’s pieces at the Guardian were published between Dec. 28 2008 and Jan. 19, 2010, focusing on the suffering (most by children) during Cast Lead. However, he also contributed prior to the war and, in an article he wrote in 2007, for instance, he admitted to having an eldest brother close to Hamas. Interestingly, on Nov. 21, two days after the scandal involving Donnison’s Tweet, while the war was still raging, Balousha wrote a story at Deutsche Welle titled ‘Israel and Palestinians wage social media war‘. It would be interesting to know if he and Donnison were similarly angry at themselves for casually propagating patently false information (to nearly 8,000 followers) about the horrific death of a child. Such journalist activists – whether they’re at the Guardian or the BBC – are risking more than their own reputations. If Guardian and BBC editors continually allow their journalists to make such egregious errors with impunity, and report the news in a manner resembling political advocacy rather than professional journalism, whatever remaining credibility they may have will continue to erode. Increasingly, as Gaza activist Ebaa Rezeq noted, “no one is going to believe [them]”. How the sloppy snakes entwine with each other uh? I totally accuse these so called “journalists” as part and parcel of an increase in anti-jewish attacks around the world. Their contribution to the lies and mistruths about Israel, are out in the public domain, their propoganda have led to Jews and non jews being attacked with anti-semitic abuse. I for one will not stand idly by as the HawHaw of 2012 continue with their “Nazi” styole propoganda against Israel. Thanks for your hard work along with others in bringing this to the fore. At least 30 children were killed in Gaza during the week of violence by Israeli airstrikes or shells. Many photos showing children killed in these airstrikes were published all over the world, including in Israel. killed by Hamas’ tactics of human shields, anti-semite. These 30 children were killed in Israeli airstrikes, Fritz. Actually, not all of them were. At least one was killed apparently by a Hamas rocket that fell short (the one paraded being kissed by Egyptians and Palestinians). There is very little proof of how the others died at all, because the Hamas authorities won’t tell. In any event – and, as I always point out, the death of even ONE child is a tragedy – in a population that is over 50% under 18, as in Gaza, it is likely that over 50% of civilian casualties are going to be under 18 too. That’s just a matter of basic chance. The fact remains, however, that the ratio of civilian:combatant deaths is BY FAR lower in this and other Israeli operations than in ANY other military operations in history, so to drag these raw stats up, distressing as they are, as evidence of Israeli brutality just simply doesn’t wash. 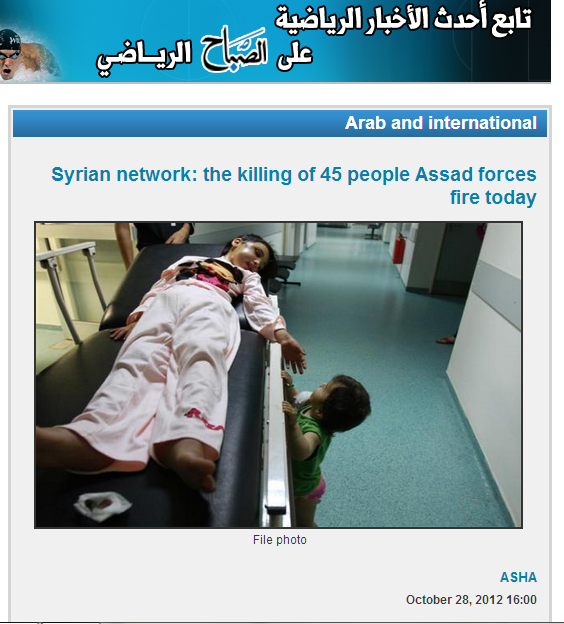 The question does arise that, given the actual death toll, why were there quite so many faked photos flying around? You really wouldn’t think that would be necessary. Not to mention, small thing called journalistic ethics, which you’d remember about if it were your ox being gored. When children die in airstrikes and are pulled out of the rubble of their houses, it makes headlines all over the world Makabit. Unfortunately, don’t think that we will reach a point where western liberals will stop giving automatic credence to stories that Palestinians invent as true events. If, after the al-Dura hoax, the Jenin “Massacre,” Hamas’ conflating civlian casualties with armed terrorists, the Pallywood exposes and they still haven’t gotten a clue, they probably can’t. It’s not possible for them to wrap their puny minds around anything but the simple formula of Israel = bad. Everyone who can must complain to the BBC about Mr Jon. After all they have relocated biased journalists from Israel before (but only when she cried live on air at Arafat’s funeral). Not that the next one wont be just as bad (probably, not definitely), but just as a matter of principle. Israel is a democracy, where we are serious about freedom of the press. Bullying journalists and attacking freedom of the press is NOT an Israeli practice. This practice is only from a handful of extremists who are so marginalized in Israel that they feel the need to go and harass British journalists. Hmm. I don’t think you can say that complaining about obvious bias, factual inaccuracy and basic failures such as fact-checking amouts to “bullying” Nat. Freedom of speech includes the freedom to criticise the press, I think you’ll find. By your argument, there would be no moderation of the press and certainly no such thing as the Leveson enquiry here in the UK. I suppose the UK government are guilty of “bullying” those poor journos who hacked and intruded into ordinary peoples’ private lives? I watched a BBC program about Scientology in the world and nearly all of the program was filmed in the US. It was very candemnatory of Scientology and I basically agree with what the program was trying to put across. Just that I was aware of being ‘handled’ by the program editors. Showing me what they wanted me to see. Quoting replies from Scientology reps, not interviewing any to get a visible response for the viewers. In short. I no longer trust the BBC to produce a program without their mindset trying to influence the material presented to me. The people shown on the program were Scientology heretics who had left the ‘church’ to live individual lives and are in serious opposition to the ‘church’ leader. But. Even these heretics are creepy people. I wonder how many in the UK have become like me? The BBC can still produce some great programs but I have been awakened to their manipulations designed to convince me of the conclusions of the editor. Not sure I agree with you Michael. Certainly far more work needs to be done to attack all the lies in a more comprehensive way. The surface has only been scratched at this point. Remember, the propagandists have had a big head start. If someone is truly a liberal, they can be won back, or at least I hope so. Unfortunately I don’t know at which point the far right wing nutcases who spend their lives indulging in conspiracy theories will stop blogging and seek psychological support instead. some people work as foeign correspondents for BBC. Some people post comments on ‘BBC watch’. Some people have blue eyes. Some people have ‘red hair’. Have Donnison’s press credentials been revoked in Israel? The last I heard there was some sort of hearing. Should the Governmeent of Israel start expelling journalists, the European Union would withdraw its ambassadors from the country. Let’s face reality for once: Israel is a democracy, committed to freedom of the press. The opinion of a handful of nutcases who hate journalists does not count. You are absolutely right, Nat (Miracles do occur). The regular talk on this site of “chucking out” journalists or removing their credentials is barmy, and totally contrary to the freedom of expression stronger in Israel than pretty much anywhere else in the world. Does anyone remember the egregious Mr Green Helmet in Lebanon, who later re-emerged in Gaza during Cast Lead?